So even though I have a fondness for Shiner that most beer writers probably don’t share, I set the bar pretty damn low for this new beer. Maybe that’s why I loved it so much when I drank my first bottle? I thought it was a matter of circumstances and perception, which can completely alter anyone’s take on a beer. I was in a good mood. The sun was shining and my expectations were low. It’s a recipe for a good review. So I drank another one a few days later, thinking my feelings toward the beer would even out. They didn’t. I still dug it. Here are my thoughts. Homespun pours copper with a thin white head and smells vaguely sweet, like an adjunct lager. A lot of people equate cream ales with lagers because some breweries will use lager yeast. They’re also relatively light, easy to drink and have a lager-like mild sweetness. 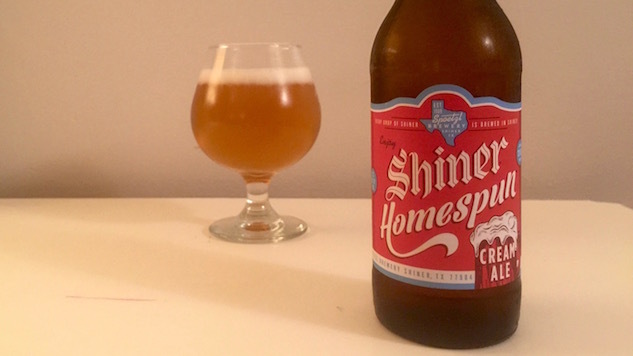 All of this is true for Shiner’s take on the cream ale. Homespun is light on the tongue and the ABV (just 5%), has a welcoming malt sweetness and is hella easy to drink. It’s the kind of beer I could knock back a six pack of without even really trying—that’s how easy they go down. There’s a German, slightly spicy hop thing happening on the back end of the sip, but the defining characteristic to this beer is the promised creaminess. And it’s truly creamy, with a body that is light to the point of being almost fluffy. The creaminess in this case comes from the boatloads of wheat that Spoetzl uses in the malt bill. And the whole package works. It’s light, crisp, fluffy, drinkable and so good it’s making me rethink my notions about cream ales as a style and Spoetzl as a brewery. That’s about all you can ask for from a beer.